Though the Punjab government has spent crores to set up the multipurpose sports stadium here with much fanfare, there is hardly any facility for the sportspersons in the stadium. The Bathinda Municipal Corporation (BMC) is all set to meet after a period of four months on November 4. The meeting may be the last this year, before the code of conduct for the assembly elections comes into force in December. The meeting may witness an uproar over the large number of dengue cases in the city with many municipal councilors complaining that fogging has not been carried out properly in their wards. Kabaddi extravaganza: Will city be a good sport? People vying to get close to Shah Rukh Khan during the inaugural ceremony of the Kabaddi World Cup, held last night, were well pacified by the Bathinda police who offered dummy autographs of the Bollywood superstar. Adamant people, most of them family members of VIPs and VVIPs were seen pestering the police officials for an autograph of King Khan. Unable to convince the crowd of fans, cops devised a novel way to avoid heated arguments with autograph hunters. The radio classroom programmes run in government primary schools under the Sarv Shiksha Abhiyaan (SSA) are scripting a new success story. Not only have the students got a unique way to study, even the teachers involved have a lot to learn from the project. A torch-bearing rally traversed the lanes of the city marking the eve of the 12-day drama fest by the Natya Manch that would begin on November 3. The drama fest is being held in the memory of great Punjabi dramatist Bhai Gursharan Singh. The poster of the literary and cultural extravaganza, Prof Mohan Singh Mela, was released today. With the fall in temperature, detection of mosquito larva, causing dengue, and fever cases are on the decline in the city nowadays. The survey teams formed by the health department and the Bathinda Municipal Corporation, found dengue larva in just two houses, though they conducted survey in over 4,000 houses in the city during the three days. And nearly 45 persons were found suffering from fever. To compel the state government to accept their long-standing demands, the Medical Practitioners Association (Punjab) has drawn up a plan to stage dharna daily from November 4-10 at Lambi (Muktsar), the Assembly constituency of Chief Minister Parkash Singh Badal. Everyday two districts from the state would take part in the dharna there. Members of the Punjab Draughtsmen Association from Bathinda and Mansa districts today staged a dharna outside the Mini-secretariat here in support of their demands. The Silver Oaks School celebrated its 12th Founder's Day, which would continue for two days more. Dr Inderjeet Kaur Khurana was the chief guest on the occasion. The function began after he lighted the lamp. The students welcomed the dignitaries with a welcome song. Yoga Guru Baba Ram Dev today took out a yatra ahead of the Gau Utsav in the city. A large number of Baba’s followers reached near the Hanuman Chowk. The NGO Sahara has donated disposal syringes, RL Glucise, DNS Glucose, bottles, I.V set and other items to the Civil Hospital (Bathinda), which would especially given to the dengue patients, who are admitted to the hospital. The junior engineers (JEs) of all the departments of Diploma Engineers Association organised a meeting in the presence of their convener of Bathinda zone Rajinder Kumar Bawa here today. is hardly any facility for the sportspersons in the stadium. Players of boxing, judo and other games practising in the indoor hall of the stadium have been without a regular coach for a long time. Now, they are even bereft of their sports kits which are dumped outside, as the indoor hall was given for practice to dancers and performers for the Kabaddi World Cup inaugural ceremony. A visit to the stadium reveals that apart from the sports kits of judokas and boxers, even the furniture of the District Sports Officer (DSO) had been dumped outside in a haphazard manner. Also, the building for the shooting range, which is lying defunct for want of funds, was converted into a control room for the opening ceremony of the Kabaddi World Cup. Some furniture of the DSO's office has now been shifted to the building of the so-called shooting range. Presently, there are only two regular coaches in the stadium, for swimming and hockey, but they have no place to practice. Players have been managing their practice session outside the stadium by pleading with the private and public institutions to provide them with ground for practice. However, there is one coach on contract basis for athletics besides a regular swimming coach. 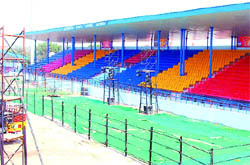 "Despite creating hype over kabaddi, no kabaddi coach has been appointed at the stadium despite spending crores on the floodlights, chairs and other infrastructure," said a kabaddi player at the stadium. The officials of the sports department said that there are five coaches on contract basis in Bathinda district. It includes those for volleyball (female) at Bathinda, kabaddi (female) at Lehra Mohabbat, wrestling at Goniana, boxing at Talwandi Sabo, swimming at Bathinda and an athletics coach, in Bathinda, on contract basis. There is a requirement for coaches for kabaddi, hockey, boxing, football, judo, gymnastic, table tennis, lawn tennis, handball, basketball, kho-kho and other games. Also there is a shortage of employees at the district sports office. Sources said that the pressure of work on the employees has increased manifold with the introduction of the new schemes but the manpower remains the same. Presently there is an accountant, a clerk, a steno (on contract basis) and six class IV employees who are also deployed for marking the ground during the sports events. District Sports Officer (DSO) Karam Singh Sidhu admitted that the problems existed but said that they would be resolved soon. Though the Punjab government claims to have encouraged kabaddi, there is no kabaddi coach in the recently built multipurpose stadium. Presently, there is neither any coach nor is there is a place to hold more than one or two games. The Bathinda Municipal Corporation (BMC) is all set to meet after a period of four months on November 4. The meeting may be the last this year, before the code of conduct for the assembly elections comes into force in December. The meeting may witness an uproar over the large number of dengue cases in the city with many municipal councilors complaining that fogging has not been carried out properly in their wards. The prime issues to discuss at the meeting would include the construction of a foot overbridge at the bus stand, setting up night shelter for the homeless, management of stray cattle, developing a jogging track at the thermal lakes, among others. The Deputy Commissioner, Bathinda, had proposed a foot overbridge at the bus stand to provide pedestrians a safer passage, thereby minimizing the number of mishaps in this zone that witnesses heavy traffic. Around Rs 30 lakhs would be spent on the foot overbridge after the House approves it. On the orders of the High Court, the BMC has been hunting for a place to come up with a night shelter for the urban homeless. During a recent survey, 41 people were found homeless. At a meeting held on January 6 this year, it was decided that land be taken from the railways for the shelter. But the railways refused saying its vacant area would be utilized for future expansion. The BMC assistant commissioner had reported that there is an old octroi post and adjoining rooms being used as a store, that can be used a night shelter. He had proposed that the store be shifted to a shop on the Amrik Singh road. The House will now decide on the proposal. The BMC House will also give its views on the proposal to send 300 stray cattle to a gaushala at Faridkot. Also, the Dera Roomiwala and Shri Gaushala Bathinda, who take the stray cattle to their cattle pounds, have requested that in view of inflation, the diet allowance for the stray cattle be increased from Rs 17 per day to Rs 25 per day. The House will decide over the new rate. The issue of taking over the charge of the musical fountain (to be installed at the thermal lakes) from the BDA would also be discussed. The BMC has proposed taking over the charge of the fountain from the BDA and collect revenue accordingly. The BDA is also developing 2.5 kms of track along the Rose Garden for jogging and cycling. For a year, the contractor concerned would be responsible for developing the track. Later, it would be handed over to the BMC. Also the shikara and boat project in the thermal lakes would be handed over to the BMC. The BMC would run these on a commercial basis. Videoconferencing being introduced for better governance and to reduce the trips of BMC officials to Chandigarh. Bathinda is among the six municipal corporations of the state to be given this facility. Exemption of house tax to Surinder Singh, the owner of property number 3810. He had pleaded that he is old and unable to pay the house tax due to poor health. Rs 6,80,915 to be released for buying fogging machines in view of dengue and malaria cases in the city. People vying to get close to Shah Rukh Khan during the inaugural ceremony of the Kabaddi World Cup, held last night, were well pacified by the Bathinda police who offered dummy autographs of the Bollywood superstar. Adamant people, most of them family members of VIPs and VVIPs were seen pestering the police officials for an autograph of King Khan. Unable to convince the crowd of fans, cops devised a novel way to avoid heated arguments with autograph hunters. To pacify the star-struck fans, the cops ended up giving dummy signatures of Shah Rukh to them. "Sometimes, the policemen cannot afford to annoy anyone, neither the public nor the VVIPs. So, they signed dummy autographs without batting an eyelid," said a senior official in the district administration, requesting anonymity. Many family members of senior officials returned without getting their children's photographs clicked with the star. SRK's bouncers did not allow anyone to come close to him and even the most influential people of the city either returned without meeting the star or wore a smile seeing the dummy autographs. "SRK's visit was planned and he was paid for this. So, he did not allow anyone to come close," said another senior district administration official. A large number of families, most of them women and children from the influential families of the city, gathered outside the Mittal Mall almost three hours before Khan's visit to get a glimpse of the star or to get a picture clicked with him. SRK stayed for a few minutes at the Hotel Country Inn in Mittal Mall on reaching the city. People were seen jostling to get close to the star but failed to get their wish fulfilled despite the hue and cry. "I told my wife not to go to see the star as it was impossible. But even then, she left with the children and came back without meeting the actor," said a senior official in the district administration. He pointed out that the family members of the VIPs and VVIPs then rushed to the stadium and pester the higher officials to arrange for autographs. The police have to pacify every one and it could not afford to upset the audience as well as the VIPs. "Many of the spectators returned with dummy autographs without a fuss. A senior official was assigned the task of signing dummy signatures of the star for the spectators," said a senior functionary, pleading anonymity. Shah Rukh spent a few hours in the city including a few minutes of performance. The Punjab government has spent nearly Rs 3 crores to make the opening ceremony a success. The superstar was the centre of attraction for everyone in the audience. Many people trying to come closer to the star were also cane-charged. Shah Rukh Khan spent nearly 20 minutes on the stage out of the 45 minutes at the stadium. He flew back to Delhi at night to celebrate his birthday with his family members. Punjab government got special permission after spending extra bucks for the special flight at night from Bathinda to Delhi. He performed for 13 minutes and got a thunderous applause from the audience. Earlier, he got pictures clicked with family members of Chief Minister Parkash Singh Badal, the first family of Punjab. He also took a round of the stadium in an open jeep and thanked the Badals for inviting him. The students of classes I to V are taught environmental studies, Hindi and Punjabi using this technique. 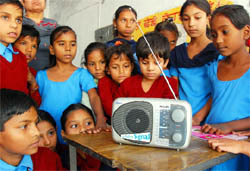 The programme was started around three years ago when all the primary schools were distributed radio sets. In the first academic year 2008-09, the programme was run for 27 days. Thereafter, in 2009-10, it was run for 51 days and for this academic session, 65 to 70 programmes are expected. Lessons for the students for this session have started from November 1 onwards. Last year too, the programme was started in the month of November and it continued till February this year. "However, it was just four days a week programme, which is now being run full throttle," said the officials of the SSA at Chandigarh. The programmes are being broadcast from the FM channel at Jalandhar, FM rainbow station, Jalandhar and the radio stations at Bathinda and Patiala. Interestingly enough, it is the teachers and their students who present the programme. So far, the teachers and the students from eight districts of the state including Bathinda, Jalandhar, Patiala, Nawansheher and Mohali have helped in the programme. To encourage the artistic talent of the teachers, the department invites them to present their scripts and enacts them with the help of their own students. From Bathinda, Hindi teachers Mona Garg and Paramvir Kaur have submitted their scripts and prepared exclusive programmes. Many teachers are associated with theatre in one way or the other. "Such teachers are an asset for us as they are well versed with the methodology of radio as a strong medium of communication. These teachers prove to be very good directors," the SSA officials said. Teachers at the Government Primary School, Model Town, Phase-I said the programme taps the vivid imagination of the young minds. The lessons on the kinds of food today depicted a man with a group of kids who posed as different kinds of food. "All these children are underprivileged and do not have enough resources to ignite their minds using the best visual aids available. From November to February, such programmes prove to be helpful in revision. It is easier to revise amongst cheerful tones and music rather than the monotonous routine," said a teacher. Radio classroom is a project of the Prasar Bharti broadcast through the All India Radio. Programmes are broadcast through the following centres: Regional Channel FM Jalandhar; FM Rainbow Station Jalandhar; local radio station at Bathinda; local radio station at Patiala. The members of the Venus Art Group, Thespian group, Dev Lok Kala Manch Jaito, Muktisar Kala Manch Muktsar, Sahit Sabha Bathinda, Lok Mocha Bathinda and Democratic Front Bathinda participated in the rally. City dignitaries on the occasion included Tony Batish, Jagmohan Kaushal, Gurdev Khokhar and Jaspal Mankhera. March started from Teachers’ home and passed through the areas of the Mall Road, railway road, Dhobi Bazar, Meha Chowk, bus stand it culminated at the Teachers’ Home. From November 3 onwards, the drama fest would begin from 10:30 am at the Baba Farid Group of Colleges village, Deon. Three street plays would be presented at the college campus. 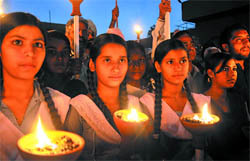 Bhai Gursharan Singh’s play Tamasha-e-Hindustan would be presented in the villages of Balarh Mehma, Jeeda and Khemuana. Bhai Gursharan’s group from Chandigarh would enact the play. Similarly, Bhai Gursharan Singh's another play Seonk (termite) would be presented in the district courts at 3 pm at Subhash Market at 4 pm and at Paras Ram Nagar at 5 pm. The Natyam Manch team would enact the entire play. From November 3 to November 11, Bhai Gursharan’s various plays would be presented as street plays in various markets, streets, mohallas and educational institutes in the city. Thereafter, on November 6, a seminar would be held on Bhai Gursharan at the Teachers’ Home. From November 8 to November 13, the plays would be presented daily at 6 pm at the Balwant Gargi Open air theatre in the Rose Garden. Patron of Mohan Singh Foundation, former DIG, Harinder Singh Chahal released the poster. He said on November 4, the Mela would begin with a prayer ceremony at the Thermal Colony stadium. Former cabinet minister Sikandar Singh Maluka would inaugurate the fest. During the inaugural ceremony, various exhibitions depicting the Punjabi culture would be shown. Students from schools and colleges would participate in painting, kavishree contests besides presenting poems of Prof Mohan Singh. The winners would be awarded with cash prizes. The main organiser of the Mela, Jasvir Singh Grewal said, “On November 5, Sikh martial arts including gatka would be displayed.” Similarly, the youngsters would present giddha, bhangra and Malwai giddha. Under the North Zone Cultural Centre (Patiala), different drama teams would present their creations as well as the folk music. President of the Punjabi Sahit Akademi Ludhiana Gurbhajan Gill would preside over a Kavi Darbar’ wherein Punjab's 25 top most poets would be participating. On November 6, 15 personalities, who have excelled in the field of Punjabi language, literature, arts and culture would be honoured. Mukhtiar Singh Badiala Sant Baba Fateh Singh Ji would be especially honoured on the occasion. Deputy Chief Minister Sukhbir Singh Badal would distribute the prizes. Also, singers including Harbhajan Mann, Gursewak Mann, Gulzar Inder Chahal, Ravinder Grewal, Sukhwinder Sukhi, Inderjit Nikku, Mohammad Sadiq, Sukhjit Kaur, Gill Hardeep, Gurvinder Brar, Manpreet Akhtar, Ali Brothers, Deep Dhillon, Manjeet Rupowalia, Hazara Singh Rasta and Pradeep Sran would entertain the audience. Besides, the number of indoor fever patients in the local civil hospital has also been decreasing nowadays. On October 29, the number of such cases was 64 while on November 1 it was 40. However on October 29, the number of rapid test positive cases was 36 while on November 1 it was just 13. However, on both dates no Mac Elisa positive patient was undergoing treatment in the hospital. According to a doctor with the fall in temperature the incubation period of the dengue fever (seven to 10 days for symptoms of fever to appear) has started now which means that the new dengue patients would have been bitten by the mosquito seven to 10 days back. He said when the temperature would come down below 15 degree Celsius, the breeding of the dengue mosquito would end automatically. As per the information, the local Blood Bank on Tuesday conducted Mac Elisa test on 99 patients from Bathinda. However, of them 44 were tested positive for dengue. Till now, as many as 581 confirmed dengue cases have been detected in the Bathinda district this season. Of these 581 cases, 496 were from Bathinda city while remaining cases were from other blocks, Goniana (18 cases), Sangat (9), Talwandi Sabo (47), Ballianwali (2), Bhagta (5) and Nathana (4). District Health Officer Dr Raghubir Singh Randhawa said with the fall in the temperature, the breeding of dengue mosquitoes would curtail in the days to come. It was also evident from the fact that the survey teams had not found larva from a large number of houses during three days. State finance secretary of the association HS Ranu said, "On November 4, the members of the association from Ferozepur and Faridkot districts would participate in the dharna and on November 5 from Moga and Sangrur districts." Likewise, members of the association from Ludhiana and Muktsar districts would stage dharna on November 6, from Fatehgarh Sahib, Ropar and Patiala on November 7, from Nawan Shahar, Tarn Taran and Gurdaspur on November 8, from Jalandhar, Barnala and Kapurthala on November 9 and from Bathinda and Mansa on November 10, he added. Ranu said there were three lakh medical practitioners in the state to whom the Punjab Government was not recognising for practice though they were providing medical services in a big way in the rural areas of the state. He said many of them have also got certificates in different systems of medicines. He said the Punjab Government had stopped the registration of medical practitioners in 1967. Since then, no medical practitioner had been registered as RMP (Registered medical practitioner) in the state. Besides, the state had also not been giving the right to practice to those medical practitioners in Punjab, who had got themselves registered in other states. He said in case the state government did not accept their demands, they would be forced to intensify their agitation along with their families. Meanwhile, members of the association from various part of the Bathinda district today staged a dharna and observed hunger strike outside the Mini-secretariat here demanding enactment of a Medical Practitioner Act, implementation of Nursing Act in a proper manner, right to practice on the basis of ability and experience and right to practice to those medical practitioners, who had the registration from other states. The agitating medical practitioners said as they had a long experience in the profession, they should be allowed for the medical practice. They said as they were serving the rural folk in a big way, their profession should be given due recognition by the government. Their demands include hike in pay-scales, revival of SDO quota for draughtsmen, conveyance and special allowance, design allowance for drawing cadre and filling of vacant posts. The dharna was staged under the presidentship of the district president of the association Baljit Singh Virk. Virk said the pen-down strike by the members of the association today entered its 15th day. He said, draughtsmen of 11 departments were taking part in the pen-down strike due to which work in these departments had been adversely affected. He added that the state government should accept their demands without any further delay as some of the demands had already been accepted by the government. The agitators also said they would not withdraw their agitation until their demamds are accepted by the state government. Meanwhile, the pen-down strike by the members of the Panchayat Secretary and Village Development Organiser (Gram Sewak) Union, Bathinda, today entered its 23rd day. They have been observing the strike in favour of their demands including implementation of Rs 10,300-34,800 pay-scale in addition to Rs 3800 as grade pay. District president of the Panchayat Secretary Union Nachhattar Singh Dhaliwal and district president of the Village Development Organiser Union Kuldip Singh Sewewala said the strike would continue until the acceptance of their demand. They presented a number of items. Along with these items, the children presented the folk dances of some states such as Dandiya of Gujarat, Naga Dance of Nagaland and a display of Punjab's culture through Virsa Punjab Da. The English plays were also presented by the students of class I and IInd. The choreography on the life of Shaheed Bhagat Singh was also done by the students. At last, principal Neelam Verma gave the vote of thanks followed by the Natonal Anthem. The yatra was taken out as a mark of respect to the cows. It passed through various commercial areas of the city. People showered flower petals on the yoga guru during the yatra. The procession went through the Arya Samaj Chowk, Dhobi Bazar, Kikkar Bazar, Sadbhawna Chowk and culminated at the Shri Gaushala in Kikar Bazar. Press secretary, Shri Gaushala, Sunil Singla said the procession was taken out by the members of the Gaushala and its chief guest was Baba Ram Dev. The residents pointed out that there is a large number of stray cattle in the city. Meanwhile, the traffic moved at snails pace during the procession led by Baba Ramdev due to narrow roads and haphazard parking of vehicles on the busy roads. The commuters remained at the receiving-end till the procession concluded at Sirki Bazar. Though adequate measures were taken by the local police and the organisers to ensure the smooth flow of the traffic in the city but many people were stranded at various places. The commuters were forced to stop at various entry and exit points in the main markets when the procession passed through the commercial areas. All the items have been given to the civil surgeon of Bathinda Dr Iqbal Singh, who appreciated the organisation for helping the patients. In the program, District Health Officer (DHO) Dr RS Randhawa, SMO Dr Satish Goyal, Sahara’s acting president Gautam Goyal and NGOs workers were present. In the meeting, they thanked the chairman of the planning committee of Mansa Sukhwiner Singh Aulakh for inspecting the canal, which is being made for the Banavali Thermal Plant and also for highlighting the scandal to the tune of crores. The council requested the government to check the works done on the Bhaini Rajbaha and Jagga branch by the officials and contractors in the absence of JEs, which could also bring another fraud to the notice of the authorities. In Chandigarh, the hunger strike of JEs has entered into the seventh day and all the JEs are on the pen-down strike from October 22.